Wheng in Manila: Born To Be A Hero Bloggers Night - Let's get Hero-rich! Born To Be A Hero Bloggers Night - Let's get Hero-rich! 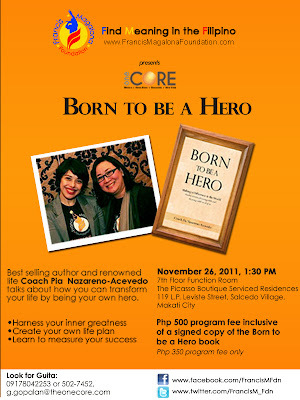 The Born To Be a Hero Bloggers Night is one among events I always look forward to get invited to. When I started blogging, I am not the type of blogger who’d broadcast the content of my site, it’s like always for myself and for a very limited number of people’s consumption. But when a friend pushed me hard to be bold and loud about my thoughts and put them to writings, I gained 30% of my much-needed self-esteem, it was not bad for a start. 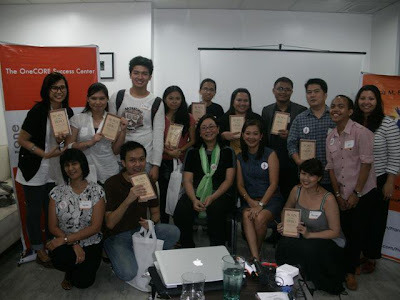 But right after we put up a site called Bloggers For A Cause, it was like the turning point of my passion for blogging. It added meaning to what I want to do best during my spare time and converted all my fears to collaboration of thoughts that lead to starting and nurturing my first blog which became four (blogs) in less than a year. The will to do something good for other people became my biggest motivation and gave the greatest feeling I never had before. In support to another significant cause, my blogger friend Ely and I attended the very first “bloggers night” presented by the Francis Magalona Foundation (FMF) which is recently launched early of October. I personally admires the Magalona family when I was able to watched them on TV when they launched it, as FMF may also be translate to “Find Meaning in the Filipinos”, I can’t help but feel the great concern for the Filipinos of the person named after it, the late Master Rapper Francis Magalona. Indeed, there is more and deeper aspirations behind every song he wrote and sing, I wouldn’t have thought of that much honestly. Since then, I found myself following what is next after launching the foundation and there I saw the invitation for the “Born To Be a Hero Bloggers Night”. We arrived late at the venue which is held in a cool place called Co.Lab. Traffic was really bad that we missed the introduction part of the core leaders of FMF and The OneCore but just right in time when the main talk is about to start. We were welcomed by FMF Chairman, Ms. Pia Magalona, who also shared that “FrancisM always believed that in order for the Filipinos to rise from poverty and other issues that concern the nation, they had to believe in themselves and have a change in mindset that hindered this transformation.” This is what Born To Be A Hero™ is all about- transforming your life by believing in yourself, harnessing your inner greatness and ultimately making better decisions for yourself, your family, your community and your country. Then, each of us was given our FREE copy of the book “BORN TO BE A HERO” which is authored by the speaker herself, Ms. Pia Nazareno-Acevedo. Later on, we proceeded to the main program and had a few fun activities which we performed with our co-blogger partners. The Born To Be A Hero program is based on the best-selling book of the same name by Coach Pia. In the book’s introduction, Coach Pia mentions that after a life changing experience she began to notice all the simple heroic acts occurring around her. Instances wherein people would go about doing “what they were supposed to do,” despite circumstances that may be happening in their personal lives. They chose to be a hero but were not aware of the heroism of their acts. Born To Be A Hero revolutionizes the concept of heroism as any act that calls for you to step out of yourself whether consciously or unconsciously making yourself present to the moment for others – and for yourself. Coach Pia was really good in discussing the book’s content where she needs interaction from us. Listening to her somehow made me realized a lot of things I should have long discovered within me – my capabilities to be a hero in my own littlest way. Plus, reading the book adds more realization significant in harnessing my own abilities and become an inspiration to others and collectively become one in becoming hero-rich to attain our goals for the common good. Indeed, it was a night I felt fulfilled despite the worst traffic I ever experienced. To be there and be able to meet important people that share with you the greater meaning of their lives, I can say it’s one of the best events I have attended so far. I’d like to recommend this to everyone who would like to have the same experience as I had, I’m telling you, and it will be so much worth of your time and money.